You know, I started out writing something much longer and more complicated, but the truth is that those of you reading here, by and large, have been here for the long haul. You were around to read about the start of Blue Riley, and about what happened when her story sold. You may very well have been one of folks who responded to my request for help with details around Wyoming in winter or the wonders of I-90. You’re the people who know about Wren, and about how I vanish into my head every spring, and how much I like turtles. So I don’t need to tell you all those things again. It’s simpler to say this: once upon a time there was a girl who loved words more than anything, and she made a deal with sadness once and gave up all her words to try to stave off change and loss, and then she realized that didn’t work, and she took her words back again. If there is a piece of me in Blue, it is that piece that puzzles over how the words fit together, and what it means to write something, and to say it out loud, in front of people. But the thing about books is that once they are out in the world, they become about the readers far more than the writers. If the world of a book being read could be seen from afar, I suspect it would look much like a jigsaw puzzle being fit together. Every individual reader a piece; their own lives, their own stories, shaping the part they create. It becomes so much more than a book, so much more than words on a page made by one person alone somewhere. In reading we are alone, but we are also together in a truly incredible way. All of which is a long way to get to the point: DEVIL AND THE BLUEBIRD is out in the world today. Thank you for being part of the journey. Rather than describe them, I’ll just use some pretty pictures. 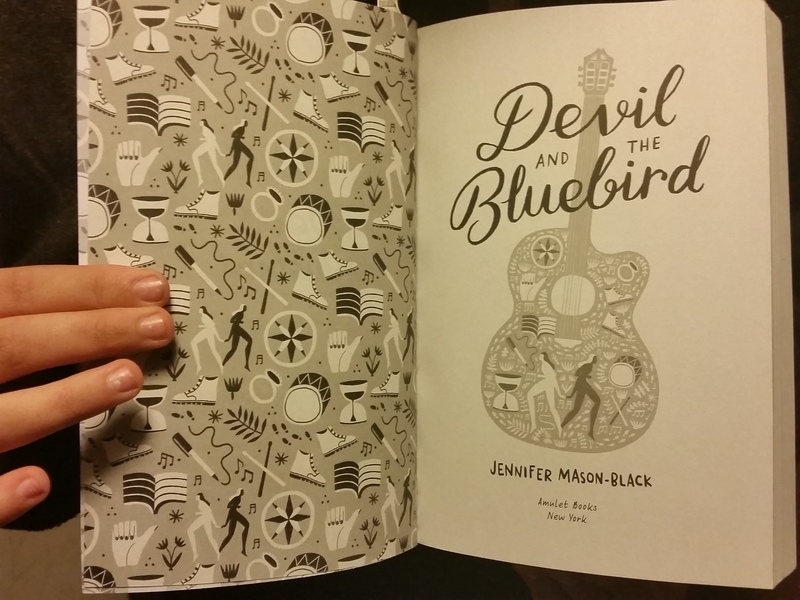 I don’t want to use this blog as a means to hard sell DEVIL AND THE BLUEBIRD (more on that to come), but I feel like this space has been such a big part of the journey that I want to show off the results. The things I’ve had to research recently for Crossroads: hopping freight trains (which I keep writing as fright trains–please, someone write that story for me, okay? ); finger picks for guitar players; constructing underground shelters; New England Patriots players (yes, I wrote that out for anyone who would be lost if I said the Pats–I may not watch football, but I am a Massachusetts native); bus lines in upstate NY; train lines everywhere; busking; surgical scars on backs; and the scenery of I-90 from Massachusetts straight through to Montana. It’s the last one that’s giving me the most trouble. I like to write about place. I like to be able to touch and smell and listen to a place, and I can’t, not for this trip. Luckily for me, it’s possible to find things like a website devoted to pictures of exits off I-90 in the Dakotas, which is something like driving driving driving across the states, if I were taking very long slow blinks. After having spent much time reading up on knives and knife fighting for The Lost and Wren, I find it both a nice change of pace (no more hunching awkwardly over the computer screen, wondering how to explain if anyone catches me watching YouTube clips on carrying concealed blades), and a little overwhelming. So many facts, and so many things I could easily focus on for months. Maybe not the Pats, or guitar picks, but the others. The world is full of fascinating things, and time is so unfairly limited. Still, I’d like more images. Not glossy coffee table book pictures, but snapshots by travelers, peeks at roadsides and city benches and the unpolished places a young wanderer might find herself. Those things feel much harder to find. If you know of any good places to look, please let me know–here, via email, by fireworks or flag semaphore, whatever suits you. Blue will be most grateful. Sorry, had to get that off my chest. I’d assumed I’d slipped into an alternate reality, something like Narnia under the White Witch in reverse, and winter would never come again. Unfortunately, that does not seem to be the case. That white stuff was lying in wait this morning. I often go to bed with my head full of whatever story I’m working on. Lately it’s been all Crossroads, all the time. It’s not the best bedtime story, as it involves being cold and broke and on the road, but I do what I can with it, tuck Blue in to some safe corner or under a big pile of leaves before I drift off. I always feel like I should dream about my characters–it seems only fair–but I never do. Instead, I dream abut other people’s characters. Last night, for example, I dreamed of Rupert and Istvan in The Mercury Waltz, a book that isn’t even out yet and one I know little about, aside from the fact that it’s a sequel to Under The Poppy. Either I’m really excited to read it or I’m the victim of an evil new dreamscape advertising scheme. Snow and dreams aside, I’m mostly just busy. More time is needed, or more hands. Maybe more brains, though that sounds rather grim. I promise I’m not taking a turn down Frankenstein Lane. No, I’m just doing the usual–writing, momming, living. Two days ago I wrote my first supernatural horror scene and realized just how subjective scary things are. Next up, I need to be thoroughly educated in hopping trains. I’ve also been writing lyrics for songs performed by multiple fictitious bands, because writing wouldn’t be writing if it didn’t hold the possibility of spectacular failure. We’ll see whether they make the final cut or end up in the Crossroads discard file. That’s the extent of things here. The draw to hibernate is currently strong, but I’ve too much to do to succumb to it. The other night I had a fabulous dream about what I should write next. Not the dream about the fuzzy caterpillars climbing all over my arm–that turned out to be the cat’s tail. No, this was one of those dreams where you wake up thinking THAT’S IT! Of course, it’s brilliant! And then you wake up just a little more and go boy wizards…I think that’s already been done. No, no boy wizards here. Instead, just Crossroads. I’ve been trying to come up with a good introduction to Blue Riley and her story. It’s hard because I maintain a certain level of superstition around talking about unfinished work, namely that if I say too much it will all flutter away in the breeze. The flip side, though, is that talking about it can also force me to stay the course, because who wants to be the person who doesn’t finish a book after publicly announcing she’s working on it? Not me. You’re a scary lot out there. So…Crossroads. Let’s see what I can say. On a cold October night, armed only with her dead mother’s guitar and her own pure heart, Blue Riley waits at the crossroads for the darkest of dealmakers. Two years ago, her older sister Cassie disappeared, leaving Blue in the care of her aunt in the middle of rural Maine. Blue’s ready to do whatever it takes to bring Cassie home. But the devil in the red dress waiting for Blue at the intersection offers her a game, not a trade. One year and a pair of hiking boots that sense the paths Cassie traveled to bring her to her sister’s side. If she doesn’t make it, she forfeits her soul–and Cassie’s. Easy enough. After all, there’s only so many roads her sister could have taken. Right? The devil rigs every game she plays, though, and the kiss that that seals the deal steals Blue’s voice with it. 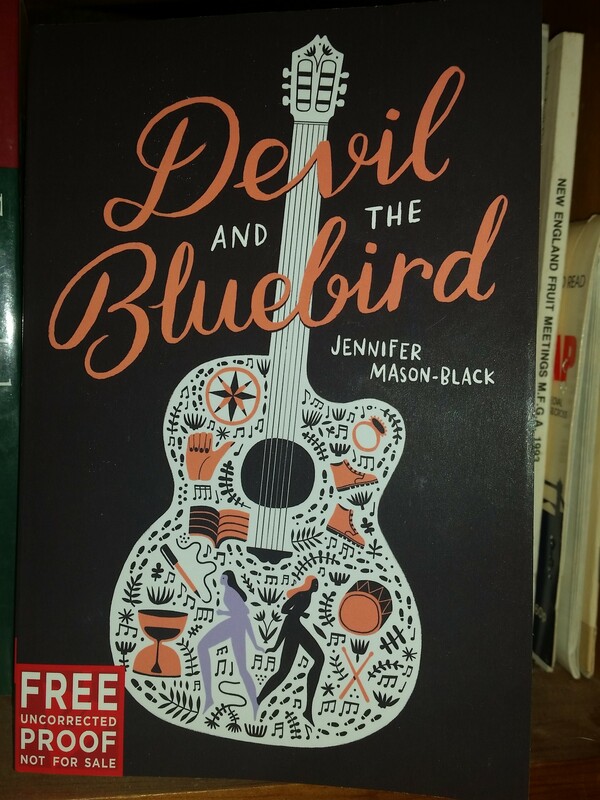 Penniless and mute, Blue hits the road with her boots and guitar, on a journey that will take her through diners and cults, underground cities and rundown roadhouses. Only the game Blue’s playing has nothing to do with the deal Cassie made, a deal with a force much more destructive than the antiquated collector of musicians’ souls who watches Blue’s every move. 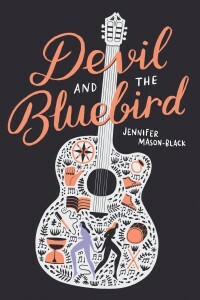 To find her way to Cassie and bring them both home again, Blue will have to confront both the devil she knows and the one she doesn’t. More snow! Yes, for all my talk about how winter must end, it simply won’t. Yesterday I had the pleasure of a) having my teeth cleaned; b) doing my taxes; c) calling the IRS to clarify something I’d received conflicting information on, listening to the same thirty-second music loop for an hour, and then being hung up on; all while d) sleet pounded on the windows. But we have frog eggs in a wading pool in the backyard, and the phoebes have returned to work on their dilapidated nest, and the daffodils are blooming, so I’m holding fast to my belief that warm days will come. I’m putting the finishing touches on a novelette this weekend, one that was supposed to be a nice little short story. It isn’t. I’m finally feeling back in the writing groove (yay!). I’ve also been doing research for Crossroads. It’s been a very very long time since I’ve worked on any novel outside of the Aware world, and it’s taken me a while to switch tracks. It’s hard to believe I’ll ever have the same closeness with another set of characters that I have with Wren and Isis and Juno. But I think Crossroads, which I keep trying to write as Crosswords (the story of a girl who trades her soul for a chance at winning the American Crossword Puzzle Tournament) (hey, wait a minute, that actually sounds like something fun to write…), will be something good. Blue Riley (Really it’s Sapphire Blue, but my mom was weird that way) has this determination to her that I love. And hiking boots, worn leather hiking boots, and bravery, and…well, I’m getting there. We’ll be friends yet. There are some sections of her story that I’m dying to write. Hey! It snowed! A lot! It’s lovely snow–light, drifting, easy to shovel (although the sheer volume is daunting). Aside from packing into the vent pipe on the roof, necessitating a climb up there to open it up again, it caused absolutely no trouble at Chez Mason-Black. There was a travel ban for the state for twenty-four hours or so, but not being someone drawn to driving around in snowstorms, I didn’t find that a hardship. Our kindhearted neighbor came with his tractor yesterday after the snow let up and dug out our driveway, so all in all, we led a rather charmed storm existence. This morning it’s 5 degrees out, and the sun is shining brightly, and I’m thinking about joining the cats in a cozy spot in the sun and working on Crossroads. I have most of it plotted out in my head. I’m sadly lacking a lot of travel experience though, and that’s hanging me up a bit. What I need is a grant to travel across the U.S. by car. What I think I’ll get are a lot more books out of the library. I may need to storm ahead and fill in some details in edits. I have a head full of characters that really need to come out. I have about fifteen different things I should be doing this morning. Instead, I’ve been thinking about who I write for, and how it’s changed over time, and whether I approve of that change, and how it’s been shaping what I write. About who I want to be when I grow up as a writer. For me, writing started as an escape, as solace. These days it’s sometimes that, but often something else entirely. I’ve been sitting at a crossroads for a while, and I have yet to choose a direction. Why do we write the things we do? What stories do we choose to tell, and why those and not others? How do you know where you want to go as a writer?